I like seeing pics of folks. So I am bumping this to the top in the hopes of keeping it going. My avatar actually is a fairly recent picture of me. I had been watching mad men and put in a bit too much Wildroot and decided to put in a bit more, thinking to myself, "Hey, lets see if I can do that..." and thought it made a cool looking profile pic. I did not know they still made Wildroot. Not only do they make it, they still sell it at Walgreens. Maybe I should let my hair grow back out. When I was younger I use to love that stuff. (03-31-2012, 10:16 PM)Johnny Wrote: Maybe I should let my hair grow back out. When I was younger I use to love that stuff. Oh to be able to let my hair grow back out......sigh! 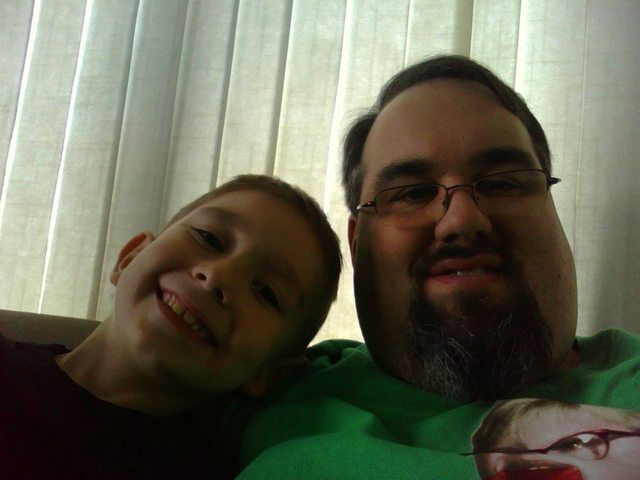 Here I am w/ my son, 8 years old. Nice looking family there Eric. (04-03-2012, 09:39 AM)Johnny Wrote: Nice looking family there Eric. Thank you very much. I think I'll keep 'em. 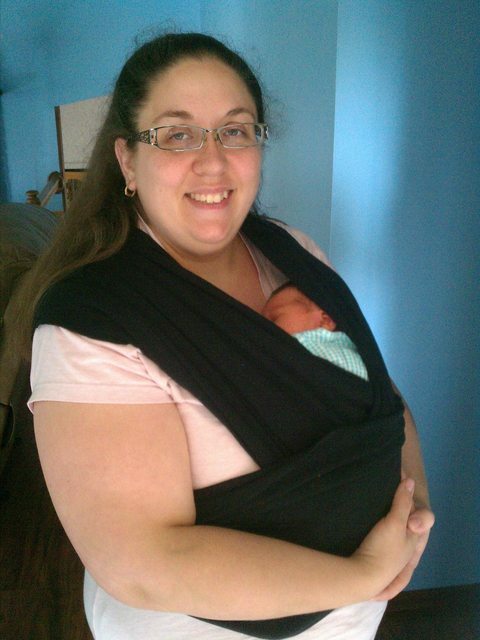 Hey Eric, how awesome is that Baby Katan for holding and carrying the baby around. I'm sure that ours will be coming out of the closet soon as we start getting out and about more with our new daughter! I love seeing others use things like that. 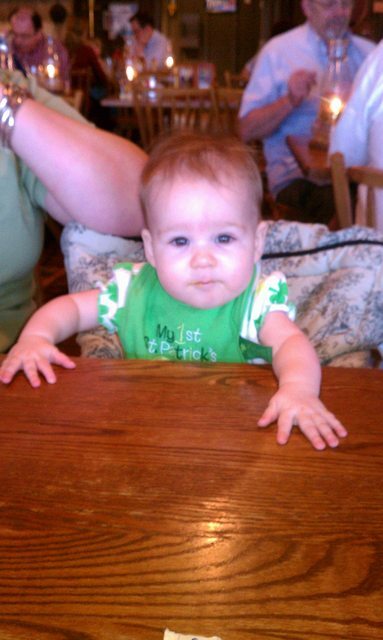 This picture is a few years old. 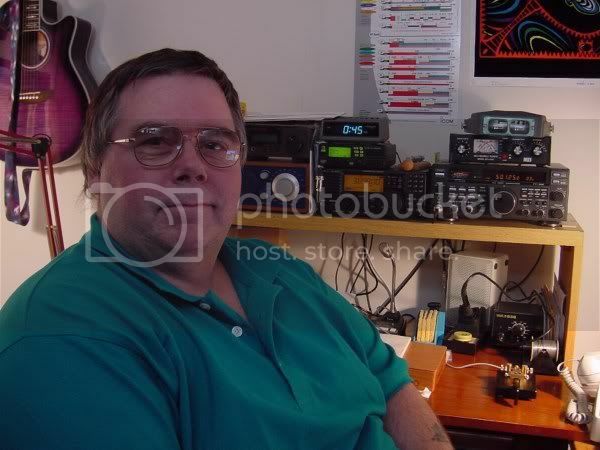 Back when I was active in ham radio. Now I've a bit less acreage, a bit more gray and the hair is much shorter. Still just as ugly, but now Old And In The Way! Nice shack there Chris, what is your callsign? Mine is N4CPA. Not very active these days either. Nice photo. (04-06-2012, 05:07 PM)daccpa Wrote: Nice shack there Chris, what is your callsign? Mine is N4CPA. Not very active these days either. Nice photo. W1CAL. I used to be very active on 6m when I lived in Hudson, NH. We bought the house where we currently live 14 years ago. There are high tension lines on the other side of my neighbor that make operating anything below 2m next to impossible. Sold all the gear and now only have a 2m rig in the car. Eventually I would like to get a mobile "shack in a box" perhaps a Yaesu FT857D. I could drive away from these damn power lines and operate hf & 6m again. I almost forgot, I am also setup to operate 2m mobile from my tadpole recumbent trike, lots of fun. Nice picture and it's good to see the key setting there. My uncle was a telegrapher for the railroad back in the 30's and 40's and taught me a little Morse when I was a kid. I was always fascinated with anyone who could master that. To bad about the power lnes. Wish I could say I mastered the code, but alas, I could do a bit over 5 wpm. It's been so long since I sold my gear, I would be hard pressed to do any code at this point. But I will say I had a blast with ham radio while I could. I've got to say Johnny, there's no denying that 1949 picture on your part! I'll have to see if I can find a picture of me as a kid and post it just for fun. I don't know, you could be the clean shaving one on the left. Proud papa and son. Nice picture. I have just come across this - what a great thread. It is really nice to be able to put faces to names.